A hardwood floor is a great investment for your home. Not only does it look great, it’s durable, easy to clean, environmentally friendly, and even adds to your home’s value. It’s important to get the right wood, though, and to make sure it fits with both your budget and your general aesthetic. Here are a few things to keep in mind when shopping for wood flooring, to help you get the best wood for your décor. There are a myriad of considerations when it comes to what kind of wood you want your floor to be. First, there’s the color. Lighter woods, like ash, tend to show dirt and damage less prominently than darker ones, like cherry or mahogany. Darker woods, on the other hand, tend to give your home more of a warm, cozy feel, while lighter ones make it feel cool and breezy. You also have to think about what specific species of wood you want. Different kinds have different properties, and each has its own pros and cons. For instance, walnut, as a softer wood, is more susceptible to damage from heavy furniture or lots of foot traffic. On the other hand, it’s less prone to light damage than some other woods, such as cherry. Maple and hickory are much harder woods, which hold up well under wear and tear. Maple is a fairly light color, but it can be stained to look much darker, and can even be made to look like other types of wood. Hickory is also a lighter color, and extremely durable. It can be very expensive to install, but once it’s in place, with proper maintenance, it can last you for decades. Think about what room you’re installing the floor in, and what that room is used for. Does it get a lot of sunlight? Do people walk (or run) back and forth through it a lot. Will there be heavy furniture, like tables and chairs, dragged across it frequently? Once you’ve answered these questions, look for the type of wood that best meets those needs. 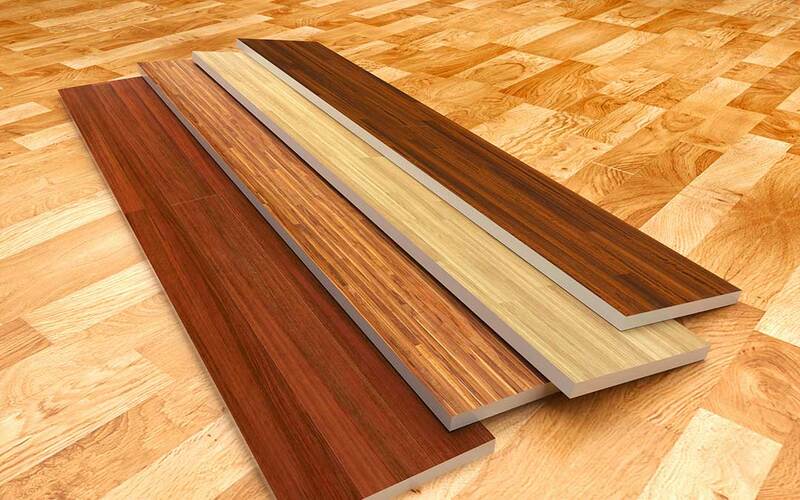 Even aside from wood type, there are many things to consider when shopping for wood flooring. One of the most important ones is your budget. As we’ve discussed already, some woods are more expensive than others. But even aside from that, there are other expenses to think about. Do you want the floor waterproofed? It will cost more, but will help it last longer and be easier to clean. You may also decide to get engineered wood, which is both cheaper and more water resistant than regular wood. Staining and finishing the wood also costs money, and should be factored into the budget. Then there’s the installation cost. Some people choose to save money by installing the floor themselves. If you do that, think about getting interlocking hardwood, which can be snapped together simply and securely without the need for nails, glue, etc. These are just a few of the factors to take into consideration when shopping for a new hardwood floor. Talk to a flooring expert to determine what kind of wood will work best for your specific needs, and what else you need to know before purchasing and installing it. The right hardwood, treated well, can make your home look amazing, and last you for many years to come.